Hume SD is a seamless blend of Hume Lake & San Diego. 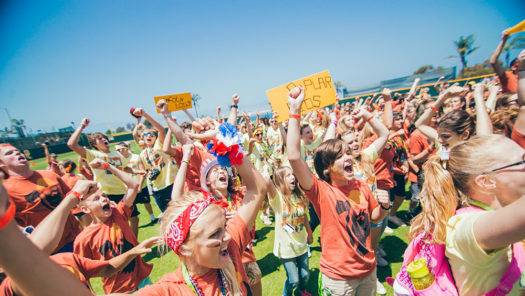 On campus and beachfront activities take full advantage of the location with powerful corporate worship, compelling teaching and full throttle recreation – providing a true camp experience for Jr. High students. Enjoy the San Diego beach culture while building relationships! Hume SD is now full – plan on coming with us next year! Students going into 7th grade (fall of 2019) and current 7th graders. We stay at Point Loma Nazarene University is beautiful San Diego, CA. Students have a variety of choices on campus or at a nearby beach for daytime activities. We start and end each day in chapel where we will experience powerful worship, engaging skits and life changing teaching from God’s word. Hmm…this one’s easy! Simply, it’ll be the best week of your summer! Dorm room living, chapel that isn’t boring, excellent food, crazy fun rec games, plenty of free time activity choices (surfing, paddle boarding, kayaking, boogie boarding, bike rides and more)! How much is it to go on Hume SD? Tickets are $450 per student. This covers your travel, meals, accommodations, and Hume SD events. You can pay for the trip in full when you sign up. Or, to reserve your spot, you can sign up and put down a $100 non-refundable, non-transferable deposit. Your spot will be confirmed when your ticket is paid in full. It’s the responsibility of the parent/guardian to make deposits and payments in full by each date specified below. Payments cannot be transferred to siblings and/or friends within 2 months of the trip. No payments may be transferred to another church event at any time. Therefore, we encourage all parents and students to plan ahead before sending a deposit and/or payment and financially committing to attend a JHM trip. Unfortunately, if your student’s account is not paid in full 3 weeks prior to the planned departure date of contracted trip, he/she may forfeit attending the trip.